We warmly invite all interested bikefitters and ergonomic specialists to participate in our series of webinars. In the webinars we’ll explain several bikefitting related topics, e.g. 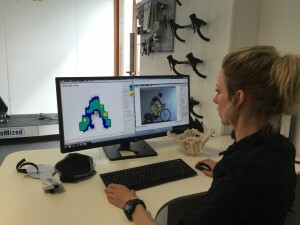 the integration of pressure mapping into the bike fitting process. A bunch of single-case-studies gives you a deep insight into the next level of bikefitting. Webinars are reserved for Fitters and Bicycle Retailers only and take around 45 minutes. Be part of this event! Admission free! The gebioMized Webinar series Contact Point Biomechanics gives profound insights in biomechanical contact point analysis. ISCO Level 3 Fitters present in an online class which questions to ask and which parameter of modern technology should be taken in account when setting up a bike using examples from practice. Bikefitters and bicycle retailers welcome! Interested in a saddle range mainly based on biomechanics and comfort? Ever thought about integrating the innovative gebioMized saddle concept into your fit studio / bike store? Here is your chance to get some detailed insights into the brandnew gebioMized saddle line-up: Join us in the upcoming free webinar and get first hand information. Please register quickly, because spots are limited!